As we grow older, changes in our memory and behavior are only natural. This is part of growing old and the functioning of our brains being affected by time. However, the symptoms of Alzheimer’s disease go much deeper than that. They are more than mere lapses in memory or forgetting details of a story. One of the best ways to properly manage a debilitating disease like Alzheimer’s is by catching it early. The 5 behaviors below are related to the brain’s ability to manage memory and judgment. In order for a doctor to accurately diagnose the onset of Alzheimer’s, you or a loved one must present with two or more of these persistent symptoms. However, a number of tests will also need to be carried out in order to rule out any other possible causes of memory or cognitive issues. Nowadays, observation of a friend or family member’s behavior is one of the best ways of detecting Alzheimer’s symptoms. Jotting down and recording these behavioral symptoms can help a doctor determine whether they are a persistent or worsening problem. Why does this matter? Because a single office-based test only provides a snippet of what’s going on the brain of an Alzheimer’s sufferer. On a day-to-day basis you may experience ”memory loss” i.e. forgetting the name of a place, but be able to remember it at a later stage. This is actually called memory lapse and is not memory loss at all. For an Alzheimer’s patient, they will forget the name of the place entirely. One of the first signs of Alzheimer’s is complete memory loss of names of friends, places, dates, appointment times etc. Typically, Alzheimer’s sufferers will not realize they have completely forgotten these things. They will ask repeatedly about names, dates, times and so on. At the onset of Alzheimer’s, a person may find it increasingly difficult to complete simple everyday tasks. An example may include preparing a meal and losing track of the steps in a recipe. They may be unable to remember a particular conversation they had during the day, or finishing playing their favorite board game. Typically, confusion will set in as to why they cannot remember these things, then frustration will take over. Remember to jot down these instances and how regularly they occur. In the beginning stages of Alzheimer’s, a person will often forget simple, everyday words. Instead, they will use nonsensical words or phrases to replace the ones they have forgotten. These simple items could include a toothbrush, instead referring to ”that thing you use to clean your teeth”. This will make their speech and writing increasingly difficult to understand and interpret. People with early-onset Alzheimer’s will start to become easily lost or disoriented in their own neighborhoods. They may even forget how they got to a certain place and how to get back home. Poor judgment goes hand-in-hand with this confusion. Behaviors such as dressing inappropriately for the weather may become a more regular occurrence. Spending money irresponsibly is also a signal for changes in behavior and judgment. In the early stages of this disease, a person may display mood swings and sudden bouts of aggression for no obvious reason. They may also become anxious, confused and suspicious of people, or become overly dependent on a family member. 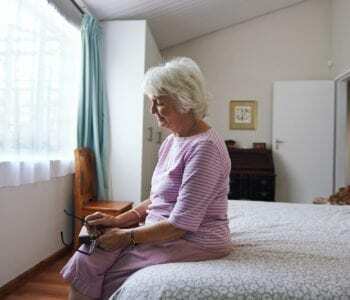 Withdrawing from social activities may also accompany this behavior, becoming reclusive and even avoiding daily activities such as bathing and eating. Looking for a Vibrant Senior Living Facility? Maple Heights Senior Living, based in Washington DC, offers a modern, vibrant and thoroughly professional senior living community. We offer both assisted living facilities and long-term memory care options, with experts specializing in the early detection of Alzheimer’s. Interested in taking a tour? See more of our facilities here.